With mom away, Rebecca Romijn‘s twins get plenty of time to play – in the airport bathrooms. 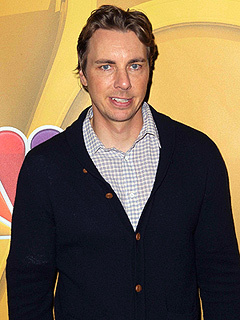 As the actress spends her time on location in Vancouver for King and Maxwell, husband Jerry O’Connell has been busy bringing the couple’s 4 -year-old daughters back and forth from Los Angeles to the Canadian locale. Fortunately, Charlie and Dolly have found that arriving to their final destination is only half the fun. “They love visiting airport bathrooms, which we all have to do together – three people in a bathroom is no joke,” Romijn, 40, tells PEOPLE. But while Charlie and Dolly have become champion fliers, keeping quiet on Romijn’s set doesn’t resonate well with the pair. “Everybody else thinks it’s hilarious and adorable when they visit. It just stresses the parents out relentlessly so they don’t come to set that often,” she says. Eventually, however, time spent perusing public restrooms will become few and far between when the twins trade in their travels for school books. “They’re going to start kindergarten soon [and] once they’re in real school I guess we’re going to have to pick a spot and stay there, but for now it’s working out,” Romijn says. With funnyman O’Connell for a father, both girls have naturally inherited a “great sense of humor.” But it’s her daughter Charlie’s curious questions that have Romijn switching from a smile to a straight face. “A couple of years ago [she started asking], ‘Mom, are you happy?’ – like 50 times a day – which is such a crazy question to get 50 times a day,” she says. More recently, the tenacious twins have taken a turn with their slew of inquiries. “Now they ask me if I’m old and they ask Jerry – especially when he’s not wearing a shirt – if he’s strong,” Romijn says. What started out as family fun on Father’s Day turned into a chance to rekindle the romance for Nick and Vanessa Lachey. When the 98 Degrees tour bus pulled into Brooklyn for a concert, Vanessa put together a special celebration to highlight all things close to her husband’s heart. And the balance couldn’t have been any better. “That morning I surprised him with a boat ride around Manhattan, and we just had lunch on the boat. It was me, him and [Camden],” Vanessa, 32, tells PARADE. Keeping the spark alive has been particularly important for the couple since welcoming their now 9-month-old son Camden John. “I think people sometimes get lost in their kids and they may have forgotten what got them there in the first place, which is their relationship,” she says. But Vanessa isn’t the only one completely smitten with Nick. According to his wife, the first-time father already has a big fan in his baby boy. “I think Cam just loves anything that Nick does – he’s such a little Daddy’s boy, it’s adorable,” Vanessa says. The strong father-son bond began when Camden was in the womb, explains Vanessa, who shares the two’s favorite tune has since been “Sleepy Eyes,” a track that now appears on Nick’s album, A Father’s Lullaby. These days, the first-time mom is juggling a full place – aside from being a wife and mother, Vanessa is also gearing up for the premiere of her new show, Dads, in the fall. But her growing list of responsibilities both personally and professionally doesn’t faze her in the least. In fact, Vanessa happily embraces the opportunities to switch up her roles throughout the day. However, at the end of the day, Vanessa’s top priority remains her greatest job to date – motherhood – and the actress is determined not to be pressured into focusing her attention on the more trivial parts of parenthood. Call it Law & Order toddler edition. During a recent trip to the park, Mariska Hargitay says her 2-year-old daughter Amaya Josephine served up some playground justice. The tot’s qualities were recently put to the test when a playmate began bullying her brother, Andrew Nicolas, 2. “Amaya went up to her and said ‘Stop it.’ She’s two years old and she goes, ‘Stop it. No! '” says Hargitay, who adopted Amaya and Andrew in 2011. In a chilling premiere episode, Hargitay returns as detective Olivia Benson on the 15th season of Law & Order: SVU, airing Sept. 25 on NBC. Her character is abducted and abused in gruesome scenes that Hargitay says took real life courage to shoot. Lucky for her, bravery runs in the family. Like any other father, Michael Bubl was looking forward to seeing his son for the first time. But, despite the build up of emotions, when Noah arrived on Aug. 27, the new dad admits it wasn’t exactly love at first sight. “I didn’t have that overwhelming feeling of love. I’m being honest with you,” the singer, 38, said during a Wednesday appearance on The Social. Since that moment, Bubl has played the part of doting daddy perfectly, learning how to soothe his son with his singing skills. Among his other newly acquired skills? “I’ve become a master at changing poopy diapers. And I can swaddle – I enjoy being swaddled myself!” he jokes. And while he’s received a fair share of advice, Bubl has adopted a live and learn approach to parenting. “Every single person in the whole world tells you how to do it a different way,” he explains. “At first it confuses you, then it drives you nuts, and then you realize that there is no right way. You just do the best you can and hope it turns out okay,” Bubl adds. Can a working mom have it all? Maybe. But for Sarah Michelle Gellar, that means taking jobs close to home. “Ultimately, yes, you hope that everybody can have it all, but everyone will tell you that is almost impossible,” the actress, 36, and mom to Charlotte, 3, and Rocky, 10 months, told PEOPLE Monday at CBS’s 2013 Summer Television Critics Association tour in Beverly Hills. “I applaud the women who can still make movies and travel all over the world, but that is not for me,” she says. The Buffy the Vampire Slayer actress, who will star this fall with Robin Williams in CBS’s new show The Crazy Ones, says while having kids affects the roles she takes, it doesn’t necessarily help with character development. Gellar looked fabulous Monday, and chalked it up to a mix of healthy eating, exercise – and a little help from Spanx. At five weeks old, Logan Vincent Herbert is making it clear that he is Daddy’s little boy. During a press tour for her new talk show The Real, Tamar Braxton gave PEOPLE a sneak into the life of her newborn. The reality star announced the birth of her son via Twitter, posting a photo of a large blue teddy bear and an “It’s a boy!” balloon. The working mom is thrilled about her new gig and says nurturing her career keeps her content. 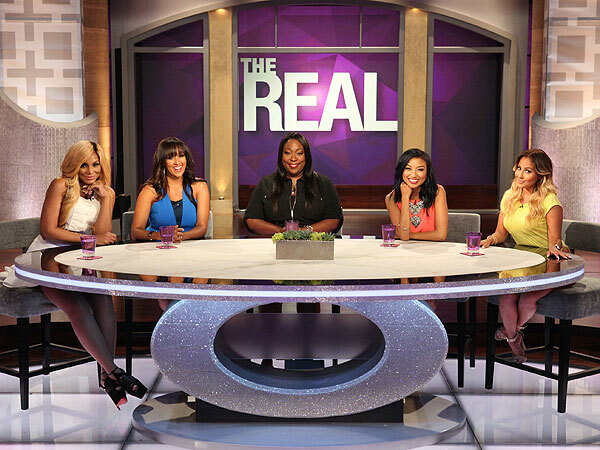 The Real, also featuring Loni Love, Adrienne Bailon, Jeannie Mai and Tamera Mowry-Housley, premiered Monday and is currently airing on FOX in Los Angeles, New York City, Washington DC, Philadelphia, Phoenix, Houston and Tampa.